No Red Tide inside Tampa Bay…. and the bite has been on fire! What has been the number one question about fishing in Tampa Bay and the South Shore area over the last few months? The answer: What about the red tide? My answer (as well as all the other captains who fish the bay) is the same. We have not seen, or heard of any red tide in the bay. The summer fishing season was fantastic, and now as we enter the fall season, the bite continues to be strong. September set record heat temperatures, and October has been extremely warm as well. The temperature didn’t shut down the bite though. We’ve seen and caught more redfish this year than in the past two. Snook have been steady all summer long. The trout bite has been good and will continue to get better, as the cool fronts start coming in. The mangrove snapper season was exceptional this year, and we landed two of the biggest mangroves I’ve seen caught in the bay (24 inches and 22 inches). Large Spanish mackerel continue to cooperate on all charters, when we target them. The giant breeder redfish came into the channel for a couple of days. Optimus Fishing Charters was blessed to be on these reds, and our clients caught and released six of these big girls. As seen in the pictures, these are truly trophy reds. Timing is everything as they are located in the shipping channel blasting baitfish. Technique is pretty simple. Throw out gold spoons, reel, and enjoy the fight, land, a quick picture and release. Talking about the channel, it’s always worth a look. Over the last two weeks we have run into large schools of big jacks. The action is absolutely nonstop. Throw out any top-water plug and it’s game on. Pound for pound, inch for inch, not many inshore fish fight harder. Fall season is now upon us. Snook, reds and trout are plentiful. 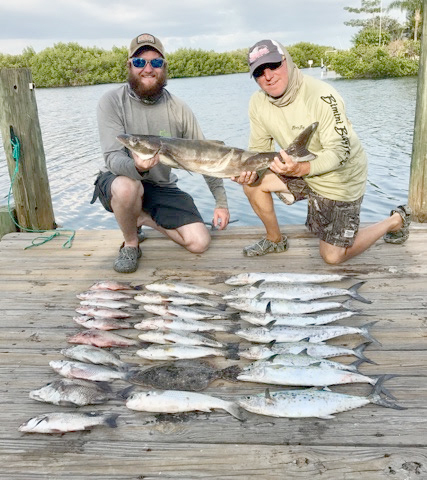 The flats also have plenty of bonnethead sharks, and the cobia are starting to show up in numbers. In the bay, large Spanish mackerel are in their normal locations and kingfish should make a strong showing within the next two weeks. If you’re looking for a great day on the water give me a call and I’ll be happy to show you how much fun our fishery can be. Hope to see you on the water. Tight lines. Captain Brian Lemelin owns Optimus Fishing Charters. You can reach him by calling 813-365-0230, or visit www.optimusfishingcharters.com.